Oliver is stunned and confused by the Random.org selection of our first entrant as the winner of our Kumfy Tailz giveaway, so I've stepped in to take over. Sometimes you just need a big guy to manage a big job. Even when I put him in charge of a small task like running a giveaway, he seems to cower at times, so it's certainly a good thing he has me to back him up. Okay, I guess that's what big brothers are for. 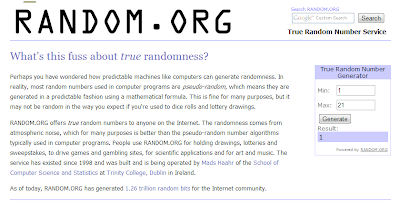 I've posted a screenshot of the Random.org drawing so you can see how it looks when we bloggers, even the furry ones, use this tool to select our winners. Pretty neat, huh? 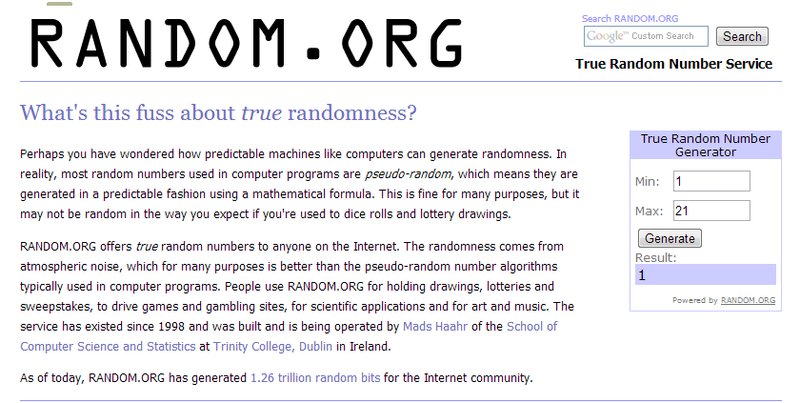 We just fill in the number of entrants in the "Max" box and hit the "Generate" button and viola', whatever that means. Mom is busy announcing her winner over at All Things Dog Blog, along with Dogtipper.com, in their joint giveaway for Event Barkers. Be sure to go check their sites out to see who their winning name is. If you didn't win and you're looking to acquire a Kumfy Tailz harness for cooling or warming your dog in extreme weather, you need only visit their website to place your order. You an also learn more or ask questions by following them on Twitter or "Liking" them on Facebook. Be sure to tell them that Tanner and Oliver sent you! The Comfy Pax gel pack pouch should be heated according to website instructions for safety and the longest life of the pouch. Sizing may be found at this same page; for best results we recommend that you take accurate measurements using a soft tape measure. A limited number of harnesses have been provided to us; we cannot make replacements for poorly-fitted harnesses. [url=http://seotools.overblog.com/]seo tools[/url], make enjoyed reading the way they viewed, but yet perhaps obtaining a couple lengths and widths small sized consequently ordinary, a shoe fitbut all of the leg-portion appeared to be too diverse. i assumed i probably would be able to create scrapebox at their thorough elevation,but way too much "slouching" produced that difficult. I need these kinds of [url=http://linkbuilding1.overblog.com/]seo link building[/url]. They fit terrific i obtained these people this coming year(The year 2010) plus they continually look impeccable! They are my personal seo tools! Didn't have this kind of backlink software. and i bought all of them. I love all of them they are unbelieveable. Ones own amazinggggg, <33333 I prefer seo link building. his or her's more advanced than bearpaws. it's a very good backlink software,, trigger I believe it really is trend for me.